We're going to go through a series of images today. The images help us understand how our customer bases actually behave. Your mileage may vary. Look at this image. This is the amount of demand a customer will spend in the next year, based on customer recency/frequency. 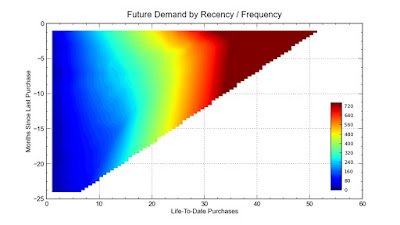 As you can see, at a customer level, high future spend happens among customers with 15+ life-to-date purchases (orange/red colors). Duh! Here's annual marketing cost per customer. The picture isn't different, is it? This company spends a ton of marketing dollars, per customer, on customers who have purchased 5+ times. Here is profit per customer. Again, the story is similar. High profit levels come from customers who have purchased 15+ times, in this case. Again, we all know this to be true. But what if we change the way we evaluate the information? In other words, what happens if we look at totals instead of per-customer metrics? How does the story change? Here are the number of customers in each recency/frequency segment. The story is about to change, isn't it? There aren't many high-value customers. Many of the customers have purchased 3 months ago or 15 months ago (in this example ... clearly indicating seasonal buying habits). The vast majority of customers have purchased just one or two times. 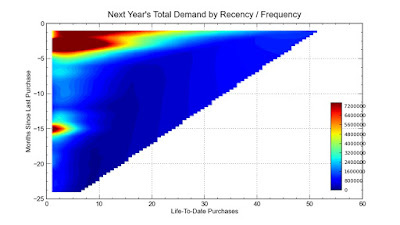 Here is total annual demand (demand in the next twelve months), by recency/frequency combination. Most of the next year's demand comes from customers with 0-5 months of recency, and within that cohort, from customers with 1-15 purchases. Here is total marketing cost. Again, a ton of marketing dollars are focused on recent, low-frequency customers ... because this is the place where most of the customer base exists. Here is total annual variable profit. Heavy profit volume comes from recent low-frequency and recency high-frequency customers. At a customer level, we like to focus on recent, high-frequency shoppers. We work terribly hard to get these customers to become even more loyal ... we'll give away merchandise (discounts/promotions) and erode profit to accomplish the goal. But if I were the CFO of a company, I'd look at these images, and I'd challenge the marketing team to develop relevant tactics for recent buyers who are early in the customer life stage. This is where the volume of demand/profit is greatest, because the volume of customers is greatest. Pay attention to recent, infrequent shoppers. This is where the annual success of a company is determined ... companies that convert these customers at low cost have a huge advantage over everybody else. Think carefully - what is your marketing program for moving a 2 month, 2x buyer to 3x status? Don't say "we send email campaigns" or "we send catalogs" or "20% off plus free shipping" ... you do those things across your customer base. What is the specific program designed to move the 2 month 2x buyer to 3x status, now?